It was only a few weeks ago that I wrote about why China doesn’t have a number one football team, and now it feels like England’s football team standards now need to be addressed following England’s premature exit from the 2010 World Cup. It wasn’t only English football fans that rode on the great wave of delusional belief that England’s national football team would thrash the Germans and was subsequently punched in the national psyche by the crushing defeat at the hands of the German team. Chinese football fans got involved too. For a nation that doesn’t have a football team in the tournament, England became the default team for the nation to rally behind and lose perspective over. The air buzzed with trepidation in the run up to the match with Germany. The local populace of Beijing donned Ingerland! shirts and reserved themselves seats at local bars showing the match, while the sports channel showed footage of previous England vs Germany matches and discussed the media inflamed rivalry between the two teams. The newspapers joined in too by also inflating the idea that Rooney would surely explode on to the pitch in this match and start making those Jabulani balls spill blood.GARGH! BOOF!POW! ROAR! Despite years of incontrovertible evidence that the England football team isn’t that good, China has, for a long time, held a deep fascination with and affection for the England football team. As far as I am aware, this began with David Beckham. Known around these parts as Bei Ke Han Mu (贝克汉姆) or Xiao Bei (meaning little Beckham… or mollusk), Beckham is showered with the respect usually reserved for a divine being or Father Christmas in other cultures. Once it is established that I am English by pretty much any Chinese person, the conversation always turns in the direction of Beckham and his fellow sporting heroes, Jie la de (杰拉德 Gerrard), Lan pa de (兰帕德 Lampard), Lu ni (鲁尼 Rooney)…, etc. After being in China for quite some time, it seems that Beckham and his fellow footballers have become the pinnacle of English identity to Chinese people. The premiership is currently by far the most popular English export to China. 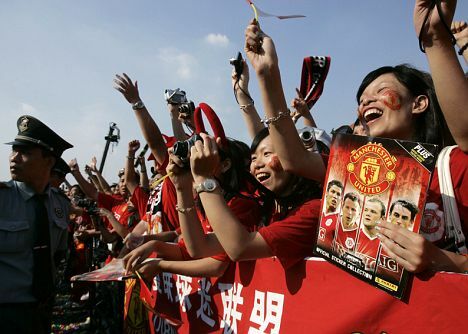 As mentioned in a previous post about football in China, China’s football league suffers from appalling corruption and so football fans tend to be more faithful followers of teams like Liverpool and Manchester United, as opposed to Beijing Guoan or Tianjin Dongli. When the Chinese football team doesn’t qualify for the World Cup, which is always, Chinese people tend to support England ahead of Brazil and Argentina, (Bridgewater, 2007) and they also have high expectations too. However, after the display of the England team (minus a Beckham), on Sunday, the delusion of the Great England Football Team shattered like a vase in a tornado in China as well. The team let down not just English fans, but also legions of (probably overlooked) Chinese supporters. 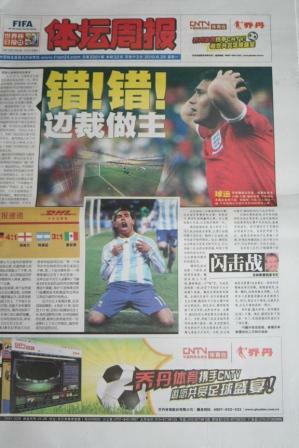 The next day, the Chinese papers described England’s beating by the Germans. However, all post match coverage seemed to focus on That Lampard Non-Goal, rather than the goals that hit the back of the net and the rather talented German players. 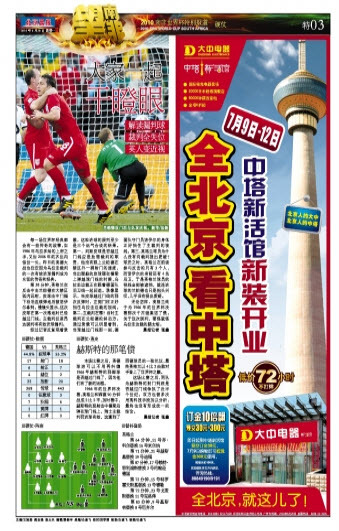 The Oriental Sports Daily placed the image of the ghost goal on its front cover, with words and sentiment more befitting of an English tabloid front page back home: Corrupt Refereeing Robs England. 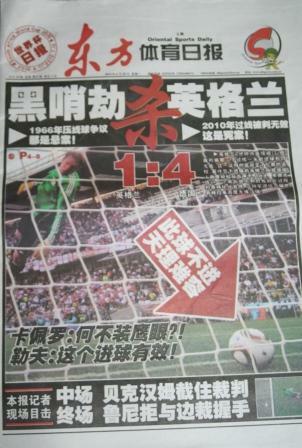 Sport’s newspaper, Titan 体坛周报 also reserved the front page for the the unaccepted goal. 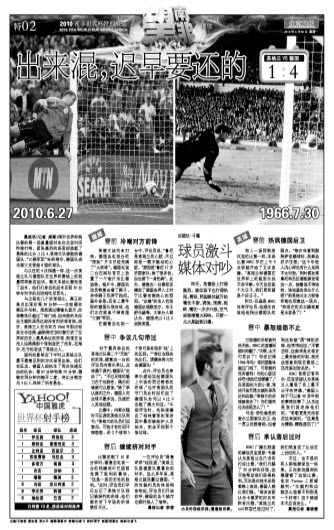 The Beijing Morning Star made comparisons to the controversial 1966 goal scored by England against West Germany, discussed the reactions of the BBC commentators, how Twitter spread the news of the injustice and shoved in an obligatory shot of Beckham (the caption beneath him mentions how dapper he looks in his little suit). However, broken hearts mend quickly and Chinese football fans are aware there are plenty more fish in the sea. Most media attention is now focussed on Argentina and Messi. 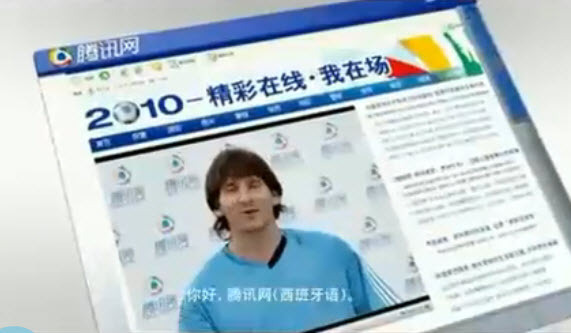 Messi is currently the face of QQ, the Chinese version of MSN. Messi advertises something has absolutely no idea about. Anyway, as China takes some time to forget England’s failure, I have a feeling that for the next few months the English football team will not be used as a cultural reference point during conversations about my nationality. ← No carts 'n' mules allowed.